At the same time the Mitsubishi i-MiEV was launched, another car was too; one of a completely opposite nature. 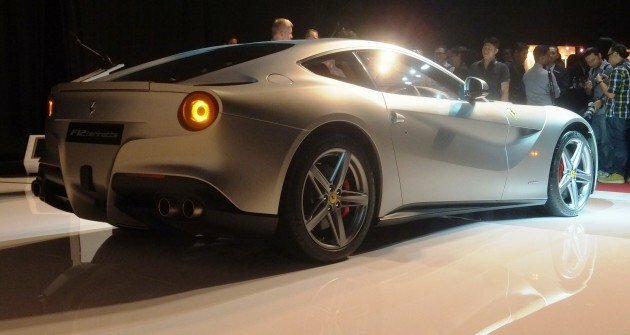 Naza Italia has introduced the Ferrari F12berlinetta in Malaysia with a starting price of RM1,288,800, excluding taxes. We’re the first country in the Asia Pacific region to receive an RHD car, in fact. When it first made its global appearance in Geneva last year, the F12berlinetta was the fastest and most powerful road-going Ferrari ever, and although the LaFerrari now holds that title, this one’s no slouch – it’s lapped the famous Fiorano test track in a quick one minute and 23 seconds. With a front mid-mounted 6.2 litre 65° V12 offering 730 hp at 8,250 rpm and 690 Nm of torque at 6,000 rpm (80% of which is available at just 2,500 rpm) and a seven-speed F1 dual-clutch gearbox, the 599 GTB replacement gets to 100 km/h from rest in just over three seconds, to 200 km/h from rest in 8.5 seconds and onwards to a top speed in excess of 340 km/h. Mind-boggling numbers, indeed. 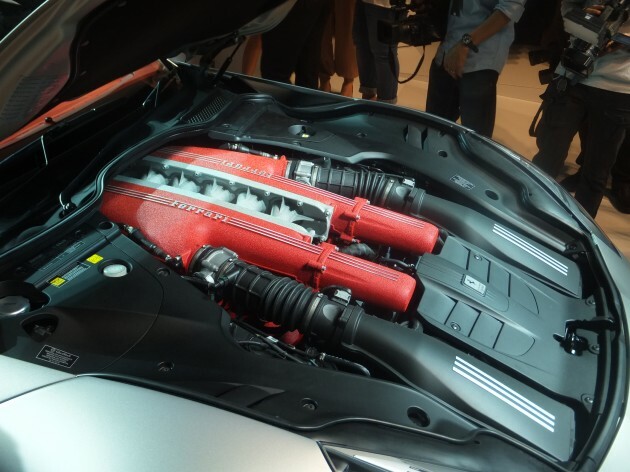 But it’s not all just about the power – the company says this engine is the first in a new generation of Ferrari V12s that have reduced fuel consumption and CO2 emissions – 15 litres per 100 km and 350 grams per km are the quoted figures on the combined ECE and EUDC cycle (with lightweight options and HELE system). Electronic equipment includes ESC, high-performance ABS and EBD, F1 traction control (F1-Trac), E-Diff 3 and magnetorheological damping with twin solenoids (SCM-E). Two body colours are offered – Rosso Berlinetta and Aluminium. A seven-year scheduled maintenance at standard service intervals (20,000 km, or once a year with unlimited mileage) is included in the purchase. Click here to digest more in-depth technical information on the Ferrari F12berlinetta, and here for pictures and videos from the international media drive in Italy last year (we weren’t there, unfortunately). Going to book one today. okay, we all believe you. Don’t worry, you’ll hit puberty someday. This car is RWD, yet can accelerate to 100 in around 3 secs. If the GT-R that your dad bought to you is ‘de-tuned’ to RWD, let’s see how long does it take to sprint to century. But GT-R cost much much less and smaller engine displacement…. 2013 already but still a ‘car’. they should produce a flying car right now…. not this 3 secs. A stupid company is a one that gives prices without taxes. That day went to Naza, guy quotes me 2nd hand 360 without taxes and when I ask with tax, he told me to give him few days to calculate. Huh? This is really stupid. Someone who can book a ferrari wont come and tell he is booking one..he or she very well knows hw to place themself under the spotlight…the car and cash talks nt words bro…chill!! I am impressed and happy for anyone who bought or plan to buy this. It is really an awesome machine. If only I had started saving since childhood. Just want to know RON97 can be use on this engine? And 6 km/litre only? Well, let see, if we start our saving at our first day of life, RM5K per month (guessing only, average people in M’sia), so it is RM60k per year, we need 25 years to reach that amount, which is just about right from your statement. If you have RM500k free from banks per year, then you can buy this car every 7 years without touching your other incomes, without sacrificing your luxury lifestyle, because I don’t know the meaning of ‘excluding taxes’. So, including tax, 25 years + 25 x 2.8 = 95 year saving at present value need 3 generations to materialize. Save for not even your son but your cucu-cicit to enjoy this car! Good luck to you …. unless you are rich man son or the son of cronies or AP King, then other than that forget about this rich man big toy ……. Saving RM5k per month is average Malaysian? Lu biaq betoi apek. Including tax = 1.29 M + 1.29 M x 280% = RM 4.9 Million Sahaja. This price excluding insurance, road tax plus AP King dealer profit! that’s the base price without taxes bro.. when the bloody taxes added, the price will be insanely high.. This is before tax,try multiple the figure by 2…that will be the estimate. (without insurance). Damn!!! I miss that most important part “excluding tax”. Why show the price before tax :( but before tax also kenot afford, therefore “tonight paste wallpaper on my iPad” hapi oledi”. Thanks all bro for highlighting to me, I was semi-happy & semi-shock upon reading 1.29Mil to own a brand new Ferrari. Along a rare few of people, I will see this as a stunning piece of design and mechanical brilliance, even as ‘The Ferrari’ is launch, this is to me, my favorite in the current stable of prancing horses. To most Malaysian, this will be viewed as nothing but a toy for the rich or corrupted rich, ridiculous, loud, and obnoxious a pointless car. How come front grill look so much like Mazda 3 smiley face ? Wow Italy copying japanese, now this is news. Better than having dugongs and later on arowana fish. out of topic: wondering if anyone frm malaysia is in among the 499 lucky souls that will receive delivery for Laferrari. if i am not mistaken there’s enzo owners in malaysia. huh.. i just bought it 3 unit, different type..now show them at my car dashboard..
what for tell price before tax? it’s like airasia advertising free ticket, but still gotta pay airport tax (if it goes to govt instead of tf songlap). How much if with Tax? So what is the estimate price on the road?? More than RM 5 Million. What a body…look at those curves….before any you say anything…I was referring to the Ferrari! Wait for Grey Import 1 year from now. They’ll be significantly cheaper. Waite for after 3 year, re-cond from UK at RM 600K on the road! Cheapest one I can find in the UK is £263k……equates to 1.33 Mil Ringits…that’s bringing one in under the MM2H program….. Anyone want to buy one from me for 3 Mil ???????? Full legal driving rights and legal transfer of ownership in 5 years !!!! Of course ALL money to be paid up front……. this car must be much more beautiful in the flesh.. I would definitely ride those… Oh, and the car as well. Naza should have brought in a RED colour for the launch. Nice car but ugly interior design..
458 looks better than this! Nampak tak permainan dia..lepas GE 13 turun la..
Vote PR and you can buy it at this price. Nak beli tapi tgk lowered sgt. Nak balik felda kang asik kena sagat je. Technically all Front Engined Ferrari cars are based on Maserati platforms. I am sure this car platform is the same as grand Turismo Maserati. well, inclusive of tax. should be around RM2.9mil. it’s kinda stupid to not include tax together. whats the point of showing pre-tax price? mmmmm.. black is always nice..
if include taxes it should be more than RM2.5mil or mayb RM3mil. Better migrate to Brunei/ Thailand/ Philippines where cars are way cheaper..and u can still live like a rich guy there. i can agree if u said brunei …..
takde tax pun cannot afford! The Polis Evo X can smoke this Ferrari like drink water. Where is the audio system? 3 Million Ringgit is pocket money for some of our CM and families ! Want money sell native lands for huge profits ! So jealous ! Ferrari F12 is so beautiful.. Kudos to the cronies & rich ppl…. Is the fuel consumption expensive? The answer is no. But anyway, a car that we are willing to pay for 7 years is a once-in-a-lifetime car(even if it is fully sponsored by banks). For day-to-day use, it is ideal for us to buy cars that worth at most a few months of our income. Remember ya employees, car loan is best kept to maximum 3 years. asyik asyik blame cronies and rich people. if you cant afford just shut up. if you want this car, then work hard, earn hard. Because cronies chronicle make sense. Yes, we work hard for that but cronies don’t..
Kalau takde kroni pun still ko tak mampu. Please accept the fact. fark this car is so beautiful. A true GT. Long bonnet design. oh shoots! they forgot to install the gear and handbreaks on the car!!! RM 3.3 Million on the road. That’s 500k more than FF. This very common nowadays, when they can’t afford then they will blame ‘cronies’. How to be successful when keep wasting time jealous of other people success??? These are those ppl that always says “This guy can afford to buy because he is the crony of who who who or because the family is Rich”. N they start to give negative remarks about those ppls without looking at themselves. Wake up n realize your own mistake if you really want to be successful. Keep complaining can get you no where but keeping yourself forever like what you are now…. Previous Post: Peugeot 208 – pics of Malaysian spec car surface!